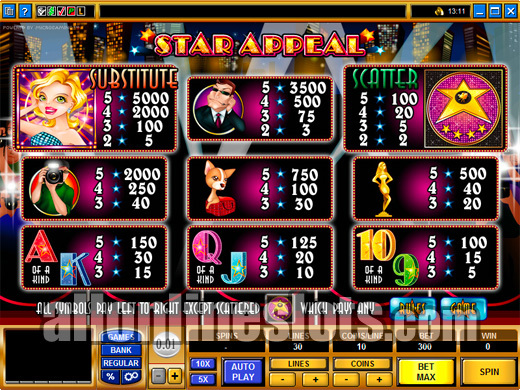 Star Appeal is a Hollywood theme 30 line slot by Microgaming. It has a free spins bonus with all wins doubled. The feature starts off with a pick a star feature where you pick stars which can award extra spins, extra wilds or instant prizes. Hollywood is one of the most famous destinations in the world and now Microgaming have paid tribute to the stars with the Star Appeal slot machine. 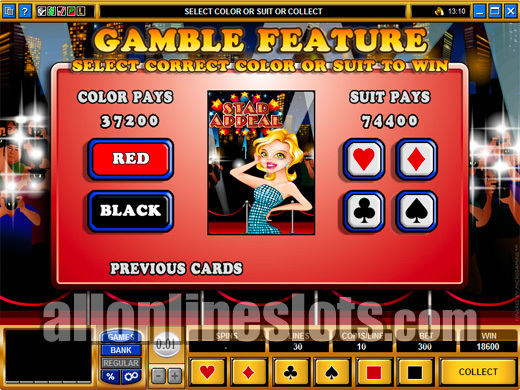 It uses the 5 reel, 30 line format and has the option to bet between 1 and 10 coins per pay line for a max bet of 300 coins. On the reels you have a range of symbols relating to stars with a Blonde Starlet, an Agent, awards, paparazzi, small dogs in handbags and of course the stars like those found on the walk of fame on Hollywood Boulevard. The actress symbol is wild and substitutes for everything but the scattered stars. Getting five wild actresses awards the top line win of 5000 coins. If you are playing max bet this pays a nice 50,000 coins or between $500 and $12500 depending on the coin size you are playing in. Of course there are lots of ways to win other than the top jackpot. Second highest line win is 3500 coins for five agents. This is followed by 3000 coins for five of the scattered stars and two ways to hit for 2000 coins with either four of the wild actresses or five of the photographers. The A, K, Q, J, 10 and 9 symbols make up all of the lower pays. The scattered star symbols are the ticket to the bonus stage. As usual you need three or more to trigger the bonus stage. Once won you move on to the first stage of the bonus which is a pick a box style game. You get nine stars on the screen and get to pick three (View Screenshot). On the pick a box stage you can win one of three things. 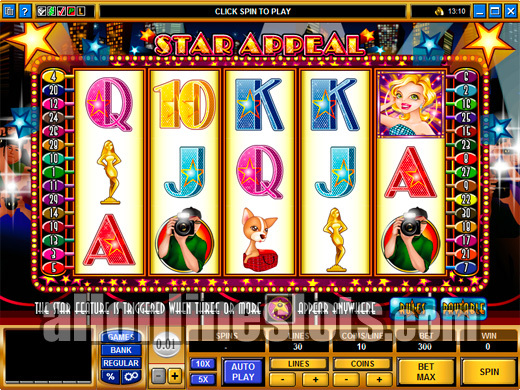 An instant prize, extra free spins or additional wild symbols. The base bonus is 10 free spins with all wins doubled. 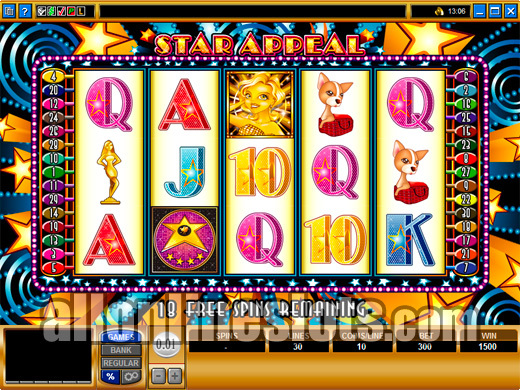 After your three picks are completed you move back to the reels to complete your free spins. If during the pick a box stage you revealed the extra wild symbols prize you get extra chances to win on every spin. The agent symbols are replaces with gold starlet symbols. This means that on the free games your chances of hitting the 5000 top jackpot for the five wilds is increased. If you do hit the jackpot on the free games you win a big 100,000 coins at max bet. Overall, a good quality game from Microgaming. We always like to see extra wilds on the free spins so this slot machine delivers on this.